So, you’re a first time user of the igoogle tau- tab. Well, we hope it won't be your last. The Tau- Tab is set up to be a convenient and easy to use tool for you that can save all of your relevant university data. A convenient tool for you to build your weekly schedule. A helpful tool to rebuild your schedule without a lot of trouble when there are changes during the semester. A tool for saving your weekly schedule, both on your igoogle account and in a printed format with all the data you need regarding your courses (courses hours, free hours, free days, your courses locations, days, hours and teachers). A place to store all of your needed web pages and links for the university (We took the liberty to save a few links for you. But you can add web Pages by your self or even let the gadget to add the web Pages of your courses for you). 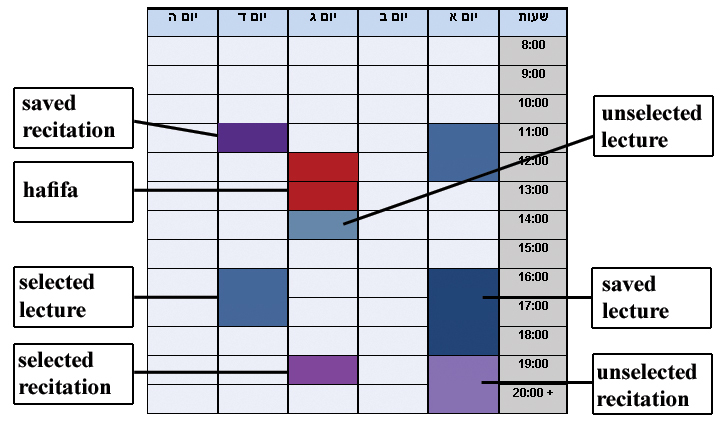 Adding your exams dates automatically to a cool Hebrew calendar, so you won't forget. Share your schedule with your friends very simply and easy. Now follow the steps described next for an easy and fun way to get all of your information. The "yedion" gadget is set up to be the main tool for your use and getting all of your courses information. First of all, verify that the chosen year and semester displayed in the gadget are indeed accurate for your use, if not you can replace them with the other options there (you should find the relevant semester their). Searching- for every course you want to add just click the course number in the appropriate column (if you don’t remember the course number, you can go to your faculty through the links in the "webPages" gadget), now click on the search icon and wait for an answer to come. In a few seconds you will get the course data displayed in the gadget (group options) and all of the options displayed in the "hourTable" gadget, or a message telling you to research if the search failed ( because of course number not found or communication problems). Saving- In order to select a group just click on it (notice that you can select any group for lectures and recitation), you will see that your hour table will highlight your selection in order to distinguish it from the other options. Once you found the groups suitable for you click on the save "icon" and only your selection will remain. Adding the site- Notice that you will be able to add the course site only if exist a web-site (otherwise, the icon won't appear). Click on the web site icon and the web site will be added to the "webPages" gadget. 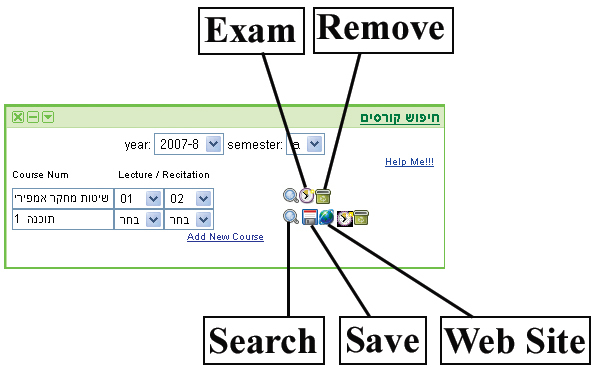 Adding the exam- Just click on the exam icon and the "moad A" exam date of the course will be added to your Hebrew calendar. Removing- If you are not satisfied from the course you chose, just click on the remove icon and the entire course data will be removed (the courses line from the "yedion", the course's hours from the "hourTable" and the courses site from the "webPages". • At any point you can add a new course by clicking on the add course icon. • After you saved a course, the search icon will become a research option so if you need to change group just click on it. • The "yedion" enables you to save up to eight courses. The hour table is set up to be a convenient tool for you to get all of your selected courses information. The hour table gets its information from the "yedion". For every hour containing courses you can find its information (courses hours, location, teacher, and group) by placing the mouse on that hour. Unselected recitation- The hour contains a recitation that wasn't chosen by the user. Selected recitation- The hour contains a recitation that was chosen by the user but not saved yet. Saved recitation- The hour contains a recitation that was chosen by the user as part of his/her schedule. Unselected lecture- The hour contains a lecture that wasn't chosen by the user. Selected lecture- The hour contains a lecture that was chosen by the user but not saved yet. Saved lecture- The hour contains a lecture that was chosen by the user as part of his/her schedule. "hafifa"- The hour contains more then one course/group (the hour table supports up to tow courses "hafifa"). If you feel you need a reminder for all of the colors and their meaning, just click no the legend icon to get a list of the colors and what they stand for. Another click on that icon will cause this table to disappear. For every options you select\save the general information of your courses hours, free hours and free days will be updated helping you to build the most convenient weekly schedule for you. Once you are satisfied with your weekly schedule you can print it. The printed document you receive will contain the hour table plus a table summarizing all of your saved courses data. The web pages gadget is set up to contain all of your needed university web sites and links. The "webPages" is loaded with a few basic university web sites and links for your use. On top of that you can always add new tabs with new sites by using the "yedion" has explained before, or manually by your self simply by adding the site's name and link. In both cases a new tab will be added to this gadget. He newly addition can be removed as well manually by clicking on the remove button, or while removing the course in the "yedion" (only for sites that were added by the "yedion") as explained before. For the tabs with underlined names you can go to full sites page, simply by double clicking on the sites name. You searched a course throw the "yedion", the options came up but the other gadgets were not updated- this is due to Igoogle's communication problem between the gadgets and its solution is to re-enter your Tau-Tab site (refresh). You try to enter the Tau-Tab page and the gadgets are not loaded. Again, try for a few more times to enter this page (it could be a bit exhausting but it will work). You get a bad request on one of the gadgets- this usually means that you selected more data then you could (apparently, more then eight courses) - You need to reload this gadget and start again. Your gadgets were uploaded fine but you don't get all of your courses data (for example the data in the hours bubble doesn't contain all of the information)- this can happen mostly if the university yedion is not working, so try again later on and it will probably be fixed. If you encounter any other problem or you have any questions you are more then welcome to contact us. We hope you will enjoy using the Tau-Tab.